Our clients know that engaged delegates are loyal delegates, and are aware of the need to build forums for live dialogue with their delegates through web-based systems, mobile devices or social media. Consequently, real-time communication and audience interaction is on everyone’s lips; especially when it comes to conferences and events. This is nothing new, but sadly still not on every agenda and certainly not integrated into every conference. But how can we transform audiences from simple attendees into engaged participants? Together with one of our technical partners, K.I.T. Group has developed a turn-key solution for audience interaction and successfully implemented it in several events within the last three months, such as the the Fall Meeting of the German Diabetes Association and the DIVI Congress. In 2016 most of our clients wanted to give their delegates more space for knowledge exchange and audience interaction. They asked K.I.T. Group to help find a smart solution enabling delegates to actively participate in live voting, to ask questions during speaker presentations and to provide instant feedback to the conference hosts. But, everything without investing in additional equipment and without expending organisational efforts for conference hosts and speakers. In accordance with the requirements of our clients, K.I.T. Group looked for a suitable solution fully connected to its speaker management system as well as to its mobile application. After a few weeks of intense research our team came up with the idea to focus on a web-based platform offering a seamless integration of voting, questions and surveys into speaker presentations as well as a customer-focused web-interface enabling a hassle-free accessible user-experience by using their own smartphones. Thanks to K.I.T. Group’s understanding of integrated technology, the new platform was geared for functional and smooth integration into our systems such as the speaker management and presentation system as well as our conference app. Speakers and partners were informed about the new feature and asked to integrate questions for voting into their lectures. K.I.T. Group’s Programme and Content Development team helped speakers identify suitable content for real-time communication with their audiences as well as with adapting themselves to new styles of moderation. 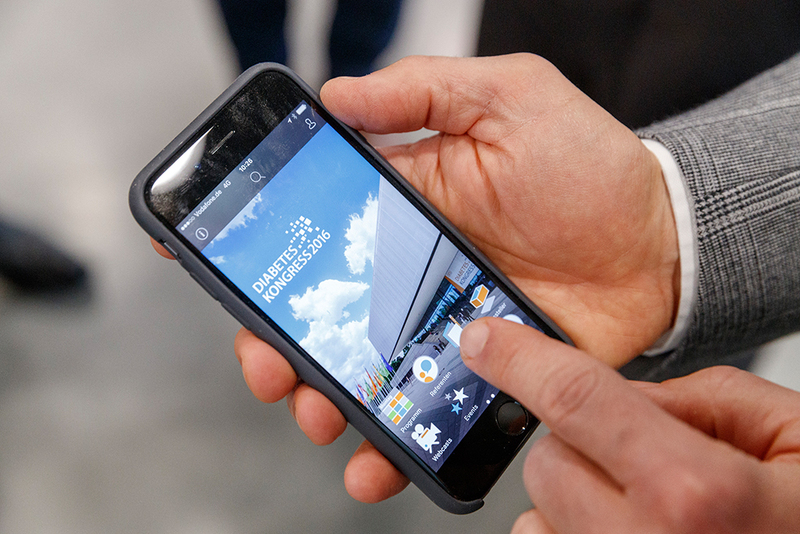 At the same time, our IT division implemented the new feature into the conference app enabling delegates to join interactive sessions through their own mobile devices. During the conferences, speakers simply uploaded their presentations in the Speaker Preview Rooms while our technical staff managed the integration of pre-defined questions by using a specific add-on customized for presentation formats such as Microsoft PowerPoint and Apple Keynote. Lectures were then held by speakers as usual and without any interruption, e.g., due to calling another programme for voting or questions. Technically speaking, no presentation exit or switch was needed as all presentations ran nonstop while using only one presentation tool and the basic presentation hardware. Once delegates were asked to vote, they only needed to open the conference app on their mobile device and click on the “Live Button”. Immediately the current question opened and the results of the running vote appeared on the presenter’s screen with no time delay. Using the “Live Button”, delegates were also able to send questions to a moderator to be answered by the speaker during his or her lecture or after the presentation in a Q&A. Moderators were equipped with a tablet and could manage incoming questions with just one click. They controlled all audience communication through a conference-branded interface and helped to enable a deeper level of audience interaction and live communication during each session. K.I.T. Group’s new advancement powered audience interaction for up to 1,500 delegates in multiple session rooms simultaneously, and with an audience engagement rate of up to 100%.